❁ Shell-pink (H16) flowers in long tapering spikes, VIII–XI; dark green foliage turning a drab green- brown in winter; height 26–30cm; spread 46–60cm. Found in the New Forest, Hampshire, and named after the director of the famous Maxwell & Beale nursery. Corolla bright red (like 'Dark Beauty'); VIII-IX; foliage green/bright green; habit broad upright. "It's a beautiful, healthy cultivar with striking flower color and floriferous." Deliberately bred, about 2003, by H. Hoekert, kwekerij Hoekert BV Oldebroek; selected and named by Henk Haalboom. ® C.2006:04 registered on 11 September 2006 by Firma W. Haalboom en Zn, Driebergen, Netherlands. Mauve (H2) flowers, VIII–IX; yellowish grey-green foliage turning orange, yellow and green in winter; height 26–30cm; spread 46–60cm. A very unusual and distinctive heather. Found by Albert Turner (The Hamlet, Hall Green, Birmingham, England) in 1972; introduced by Denbeigh Heather Nurseries (Creeting St Mary, Ipswich, Suffolk) in 1978. Named after Albert Turner's house. White flowers, VIII–IX; mid-green foliage; vigorous; height 31–45cm; spread 46–60cm. A very old cultivar, but still one of the best. Introduced by 1850; listed by John Frazer (Leyton, Essex, England) in 1866, and by Lawson Seed & Nursery Co. (Edinburgh, Scotland) in 1874. White flowers, VIII–X; light green foliage with yellow shoot-tips in spring and early summer; height 26–30cm; spread 31–45cm. Keep well pruned for maximum effect. Found by James Smith (Darley Dale, Derbyshire, England); introduced by James Smith in 1925. The derivation is not clear; perhaps a sport on Calluna vulgaris 'Hammondii' with golden foliage, but more likely to be a seedling from 'Hammondii'. Named from aureus = golden yellow; folius = leaf. Lavender (H3) flowers, VIII–X; red tipped young growth in spring; height 26–30cm; spread 31–45cm. Keep well pruned. Sport on 'Hammondii Aureifolia'; introduced by Maxwell & Beale (Broadstone, Dorset, England) in 1938. Named from ruber = red; folius = leaf. An allusion to the parent plant. Flowers white; VIII; foliage yellow; height 20cm; spread 50cm. Raised by Jürgen Krebs (Hoyerhagen, Germany); recorded in Botanischer Garten, Bremen, Germany, in 1998. White flowers, VIII–IX; bright yellow-green foliage throughout the year, flecked with bright yellow; compact; height 26–30cm; spread 31–45cm. Recommended. ❁ Shell-pink (H16) flowers, IX–XI; dark green foliage; vigorous, erect; height 46–60cm; spread 61–75cm. Wild-collected; found on the North York Moors, England, by Harry Gibbon of Messrs R. V. Roger Ltd (Pickering, Yorkshire); introduced by R. V. Roger Ltd by 1979. Named after the finder who was a gardener on the staff of R. V. Roger. Calluna vulgaris f. multibracteata; blooms much later than other cultivars. Flowers lavender (H3); not opening fully, but not bud-flowering; solitary at apex of short, multibracteate side-shoots on underside of main stems; X-II: calyx lobes to 3.5mm long, 2mm broad, ovate; corolla to 3mm long; stamens 8, not apparently malformed; gynoecium present, not malformed. Foliage dark green. Habit bushy; height 25cm; spread 30cm after 2 years. Sport on ‘Chase White’ found by Harry Bowen in his garden at Chase Road, Falmouth, Massachusetts, USA. Named after Mrs Grace Bowen, and Mr Harry Bowen. 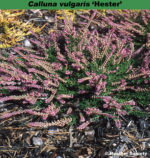 ® C.2010:01 registered on 17 February 2010 by Northeast Heather Society, USA. Delightful pin-cushion with bright green foliage; height less than 10cm; spread 16–20cm; does not flower. Ideal for trough gardens. ❁ Deep pink flowers, IX–X, larger and darker than 'H. E. Beale'; grey green foliage; broad, upright, bushy habit; height 46–60cm; spread 46–60cm. White flowers, VIII–IX, free-flowering; mid-green foliage; neat upright habit; height 31–45cm; spread 46–60cm. "Chance sedlings" found by Robert Hayes (Grasmere, Cumbria, England), and introduced by Geoffrey Hayes about 1900. Pale lilac-pink (H11) flowers, VIII–IX; light green foliage, with yellow (and a hint of pink) shoot-tips in spring; broad upright habit; height 25cm; spread 40cm. Deliberately raised in 1988 by Brita Johansson. Hebbe was the nickname of a character in a Swedish television series about a rag-and-bone man, Albert, and his son, Herbert ("Hebbe"). ® C.2008:08 registered by Mrs Brita Johansson, Vargön, Sweden. 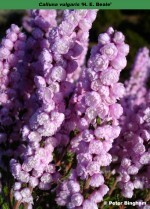 Lilac-pink (H11) flowers, VIII–IX; dark green foliage; low spreading habit; height 10–15cm; spread 21–25cm. Found by F. Kircher (Germany) in 1955; introduced by Baumschule Wohlt (Germany) in 1968. Named after a hospital in Hamburg/Langenhorn, Germany. Mauve-pink (H2) flowers, VIII–IX; fresh green foliage; compact, low creeping habit; height 10–15cm; spread 31–45cm. Pink (H8) flowers, VIII–X; dark green foliage, acquiring bronze tints in winter; strong erect habit; height 31–45cm; spread 46–60cm. Lilac-pink (H11) flowers, VIII–IX; dark green foliage; low spreading habit; height 10–15cm; spread 31–45cm. Heliotrope (H12) flowers, VIII–IX; soft green foliage; prostrate habit; height 10–15cm; spread 26–30cm. Found by Fritz Kircher, former President of Gesellschaft der Heidefreunde. ❁ Rose-pink flowers, IX–XI; dark green foliage which turns grey-green in winter; open erect habit; height 46–60cm; spread 61–75cm. It was found in 1980 on the nursery of Martin Zimmer at Wiesmoor, Germany, as a sport on 'H. E. Beale'. White flowers; IX-X; foliage grey-green with cream-tips in spring and early summer; habit erect; height 40cm; spread 55cm. A sport on 'Beoley Silver' . Found in the garden of Jack Platt in 1984 and named after his granddaughter. ♤ White buds, IX–XII, very abundant; light green foliage; upright; height 26–30cm; spread 31–45cm. A sport on 'Alicia'; the buds develop later and remains fresher for longer, resulting in a long season. Found by Thomas & Helmut Hiedl, Altusried, Germany, in September 2003. ® C.2005:08 registered on 31 December 2005 by Kurt Kramer, Edewecht, Germany. ♤ Bud-flowering, red (H5-H6), buds small; IX-XII; foliage bright green; habit upright, broad; height 50cm; spread 50cm after 4 years. Sport on ‘Angie’ found by J. van Leuven in October 2007. ® C.2011:12 registered on 25 November 2011 by J. van Leuven, Geldern-Lüllingen, Germany. ♤ Shell-pink (H16) buds; IX-XII; with mid-green foliage; after 3 years 30cm tall, 25cm spread. Sport on 'Helena', found by Kurt Kramer in October 2007. ® C.2009:02 registered on 11 March 2009 by Kurt Kramer, Edewecht, Germany. White flowers, VIII–IX, very floriferous; bright green foliage; upright; height 31–45cm; spread 61–75cm. Heliotrope (H12) flowers, VIII–IX; dark green foliage; spreading; height 16–20cm; spread 31–45cm. Wild-collected; found in the New Forest, Hampshire, England, by G. Seppen (Putten, Netherlands) about 1971; introduced by P.G. Zwijnenburg (Boskoop, Netherlands) in 1974. Named after the finder's eldest daughter. Mauve (H2) flowers, VIII–IX; yellow-orange foliage turning bronze red in winter; upright; height 16–20cm; spread 31–45cm. Found by H. Hoekert (Oldebroek, Netherlands) in 1973; introduced by Hoekert in 1983. Named after Miss Hetty Kampluis, worker in the nursery which introduced it. Mauve (H2) flowers, IX–XI; dark green foliage; height 26–30cm; spread 31–45cm. Outstanding in The Heather Society trials. Said to have been collected in Ireland [but see Etymology]; and apparently named by 1933 (perhaps by Maxwell & Beale). Name hibernicus can mean pertaining to winter or Irish; the former seems a more likely derivation given the flowering season. Amethyst (H1) flowers, X–I; mid-green foliage; height 31–45cm; spread 46–60cm. Outstanding in The Heather Society trials. Wild-collected; found in the Pyrenees near Hyères, France, by C. J. Marchant (Stapehill, Wimborne, Dorset, England) before 1932. Named from hiemalis = of winter. This name is correctly applied to Marchant's Pyrenees clone. Flowers pink (H8); VIII-IX; foliage cream in spring and early summer, later silvery grey-green; habit erect, broad, vigorous. A sport on 'Darkness', from Highland Heathers, Achahoish, Argyll, before 1992. Deep rose-pink (H7) flowers, VIII–XI; golden bronze foliage; height 31–45cm; spread 31–45cm. Lavender flowers, VIII–IX; pale green foliage, young shoots tipped cream and orange in spring; height 21–25cm; spread 31–45cm. Found at Highland Heathers (Achnahoish, Argyll, Scotland) by Nigel Willis. ♤ Flowers buds brilliant violet-blue ( H3 lavender), 4mm long, 1.5mm across; IX-XI; foliage dark green with mid-green new growth; habit upright; height 30cm; spread 25cm after 3 years pruned. Deliberately raised seedling, cross made in October 2005 by Helmut Hiedl; selected in October 2006. ® C.2014.01: registered on 9 January 2914 by Helmut Hiedl, Altrusried-Krugzell, Germany. Mauve (H2) flowers, IX–XI, in graceful, long spikes; mid-green foliage; upright; height 46–60cm; spread 61–75cm. Seedling; found by C. Turberfield (Blyth, Nottinghamshire, England) in 1976; given to Tabramhill Gardens (Arnold, Nottingham) in 1977 and subsequently introduced by Tabramhill Gardens. Named after Mr Turberfield's wife. White flowers, VIII–IX; lime-green foliage throughout the year; open, erect habit; height 26–30cm; spread 31–45cm. Introduced by Little Park Nursery (Flowton, Suffolk, England) before 1989. Mauve (H2) flowers, VIII–IX; striking orange-red foliage in winter, turning orange-gold in summer; compact; height 26–30cm; spread 31–45cm. Considered by some to be an improvement on 'Robert Chapman'. Mauve (H2) flowers, VIII–X; dark green foliage, in spring the young shoots are tipped with shades of cream, pink, red, orange and copper; bushy; height 31–45cm; spread 46–60cm. Introduced by Little Park Nursery (Flowton, Ipswich, Suffolk, England) before 1985. Name alludes to the foliage colours in Spring. White flowers, VIII–IX; very bright green foliage; spreading; height 31–45cm; spread 61–75cm. Seedling; found by Mr Prescott (Rosebank Nursery, Hinton House, Lydiate, Maghull, Merseyside, England) before 1983; introduced by R. G. Rimmer (Hinton House Nursery) before 1989. Named after Mr Prescott's house. White flowers, VIII–IX; soft, hairy, grey-green foliage; height 31–45cm; spread 61–75cm. Similar to 'Silver King' and 'White Gown'. Named from hirsutus = hairy; albus = white; flos = flower. Mauve (H2) flowers, VIII–IX; hairy. silver-grey foliage; upright; height 31–45cm; spread 46–60cm. Named from hirsutus = hairy; typicus = typical. Lilac-pink (H11) flowers, IX–X; mid-green foliage; very vigorous with an erect habit making it suitable for cut flowers; height 61–75cm; spread 46–60cm. Sport on 'Long White'; found by C. Bouter (Boskoop, Netherlands) in 1968; introduced by C. Bouter in 1973. Named from the Latin form of Holland. Lilac-pink (H11) flowers, VIII–IX; golden yellow foliage, turing coppery red in winter; height 31–45cm; spread 46–60cm. Particularly richly coloured in winter. Seedling; found at H. Hatje's nursery (Tornesch-Ahrenlohe, Germany) in 1980; introduced by H. Hatje in 1984. Heliotrope (H12) flowers, VIII–IX, in long spikes; dark green foliage; height 46–60cm; spread 46–60cm. A distinctive flower colour, and well worth growing. Wild-collected; found in the middle of a gorse bush at Hangmore Hill, Chobham Ridges, Surrey, England, by Mrs C. E. Underwood, in 1935; introduced by G. Underwood (Hookstone Green Nursery, West End, Woking, Surrey) in 1945. Named after the Underwoods' nursery. Pale crimson (H13) flowers, VIII–IX; bright orange-gold foliage, deepening in winterl; height 21–25cm; spread 31–45cm. Very hardy and needs a harsh environment to colour well. White flowers, VIII–IX; yellowish new growth giving a mottled cream and green effect; height 26–30cm; spread 31–45cm. Found by J. W. Sparkes (Beechwood Nursery, Beoley, Redditch, Worcestershire, England); introduced either by J. W. Sparkes or J. F. Letts about 1966. Named after a friend of J. W. Sparkes and a well respected member of The Heather Society. White flowers, VIII–IX, but sparse; bright green foliage; slow growing, and develops in a humpy manner, hence its name; height less than 10cm; spread 10–15cm. Found at Beechwood Nursery (Beoley, Redditch, Worcestershire, England) by J. W. Sparkes; introduced by J. W. Sparkes by 1963. Named after the character in the nursery rhyme, and alluding to the habit. The name should not be hyphenated. 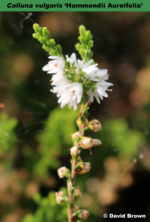 Pale lavender (H3) flowers, VIII–IX, of little merit; mid-green foliage, turning a dull brown-green in winter; neat dwarf habit; height 10–15cm; spread 26–30cm. Named from Hypnum a genus of mosses; -oides = resembling; i.e. moss-like.